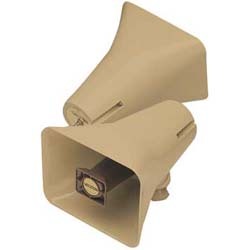 The Valcom One-Way Bi-Directional Horn is a bi-directional, 5 watt one-way amplified horn assembly. The V-1050C consists of two horn speakers positioned on a common mounting frame with a built-in one-way 5 watt amplifier. ValcomProducts.com is a leading provider of paging systems and accessories. We specialize in Valcom paging systems and accessories for small to large companies. All orders, small or large, are welcomed with no minimum order requirements.